Thousands of Burmese citizens, lead by Buddhist monks, have forced a beastial dictatorship into check. Images of the protests and of their consequent repression have exposed before the international public a detestable regime, and citizens whose struggle for liberty and democracy should be a reference for the modern world. THE BEGINNING OF THE MOVEMENT, already known as the Saffron Revolution, took place several weeks ago, when the military government of Burma, who renamed the country Myanmar, decided unilaterally to implement a significant price increase in the price of fossil fuels. This decision had immediate repercussions on the prices of primary necessity items throughout the country. Burma is a country with bountiful natural resources, and great economic potential, but the corruption and poor governance of the military government has brought the country much poverty, and the price hikes are especially punishing thousands of citizens who are already living in extremely dire conditions. To crack this rise in prices; localized protests of small groups of citizens asking for a reduction of these prices succeeded in various Burmese cities. Rapidly, the weight of the repressive atmosphere and lack of freedoms imposed by the military during recent decades, led to a spontaneous movement, led by Buddhist monks, which transformed into an organized campaign to promote a political change in Burma. 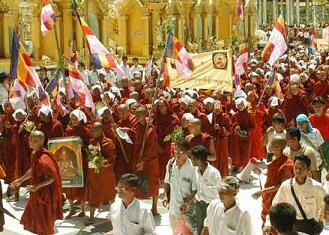 The leadership of the monks demonstrates their importance in Burmese society. The constant repression of the military government has undermined the foundation of civil society. Political, social, and cultural organizations not controlled by the army simply do not exist, except for those which are done in secret. The Noble Peace Price winner Aung San Suu Kyi, who was incarcerated by the military regime 20 years ago, continues to be a symbol of the oppression of the regime, but her party still does not have the ability to demonstrate in the streets. The solitary exceptions to this iron-fisted rule, due to their historic and moral prestige in Burmese society, are Buddhist monasteries. The monks have already played a key role in protests against the military regime in 1988, following the deaths of more than 3,000 people. In this case, with the lesson well learned, they have generated an extremely well planned movement, based in the politics of non-violence and a campaign of mobilization in ever-increasing phases. In the first moment, taking advantage of the moral shield against repression provided by their moral prestige, the monks have taken a stand by asking for economic changes, and protesting around religious symbols. Afterwards, they protested around the Chinese embassy, the principle international ally of the regime, recovering the bonds of cooperation and brotherhood with that country, and only in the last phase have they taken more defiant steps, marching on the centers of power, and calling for the massive and non-violent participation of the society to enact a peaceful political change. The military regime was shocked by the thousands of protesters in the streets of Burma, and they reacted with their habitual method of violent repression. The Tatmadaw, the Burmese army, has mobilized their elite units who normally combat rebel groups in bordering zones, to combat the peaceful protests lead by the monks. This resulted in the detention of hundreds of people, the looting of monasteries, and numerous protesters murdered at point-blank range in the streets. The military government does not officially recognize more than 20 deaths, but the figures of Burmese organizations speak of hundreds. However, international pressure has limited the violent scope of this repression, and the regime has been forced to receive, Ibrahim Gambari, a special correspondent of the United Nations. The reaction of international society has been practically unanimous in condemning the military government, including countries who maintain commercial relations with the regime, such as India, and the constituents of ASEAN (Association of Southern Asiatic States). The United States, the European Union, and Japan have enacted a policy of renewed diplomatic and economic sanctions towards Burma, but the geopolitical key to the crisis lies with the Chinese giant, due to its traditional international support of the Burmese military regime, with whom it maintains strategic military and energy relations. The traditional stance of the Chinese government has been opposition to interference in the internal affairs of other countries, which has been put into question by the rest of the countries involved. It seems unlikely that the Chinese government would be able to appear concerned with these pressures, keeping in mind its own questionable internal policies regarding human rights and democracy, but there are two factors that could modify the governments´ stance: Its desire for stability for the countries bordering Burma, as it now appears that the military regime is no longer capable of providing this, and the 2008 Beijing Olympic Games which will be celebrated next year. China wants the Games to symbolize its new role as a world power in the 21st century, and an foreign policy of clear support for governments that do not hesitate to massacre citizens who protest peacefully, will not help achieve this. The Chinese government wants to avoid by all means the ghosts of political boycott, which succeeded in the cases of Moscow in 1980, or Los Angeles in 1984. The key to a positive resolution to the crisis, which would involve a start to legitimate political change in the country, lies within the strength of the non-violent political protest. If this sentiment continues to live in the streets, and if it is able to rebuild itself in the coming weeks, the military government will feel more pressure to start negotiations with the opposition. Democratic countries must continue to pressure the Chinese government to carry out a constructive role in the crisis while at the same time adding to the sentences, incentives, and proposals for a transition such as sanctions that can be lifted depending on the positive cooperation of the Burmese regime. On the other hand, Aung San Suu Kyi, and her party must remain faithful to their principles, and at the same time be capable to showing true flexibility if the military government begins to make decisions on the right path: a constructive dialogue with representatives of all of the political opposition is needed in order to facilitate a transition to a democratic regime, headed by civilians, wherein the monks are able to return to their monasteries, and the military to their barracks. I’m originally from India but now I am living to the wild country that you could read in the post title ;). Im really quiet but I still enjoy travels. I also like video games. I’m 22 years old. I am so excited to be part in this association. My boss once claimed – and I s**t you not – that he has proven mathematically that global warming does not exist and that its just cyclic heating and cooling on earth. He’s got an undergrad in mechanical engineering, so he’s surely an expert…. just about quit and walked out after I heard that.